Call me crazy (cat lady) but I love kitties. I’ve been a cat person (and a dog person, all animals really) since I was a little girl. I love cute animal crafts, cat crafts, animal trinkets and cat stuff in general, so when I made this Kitty Cat Tote Bag I knew it would be a project I had to share with you all one day. 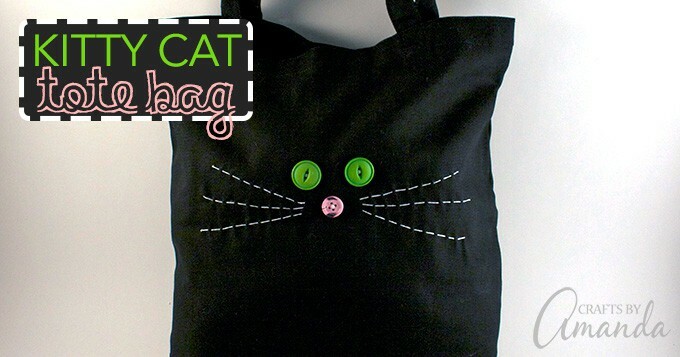 This is a fun beginner sewing project for a young child. I used a tote bag, but you could do this on a hat or a pillow cover as well. There’s no sewing machine involved, only hand stitching, which is great for the younger set. It’s also a nice project for seniors or those in rehabilitation as it’s not a long drawn out project, but a craft that comes together pretty quickly. 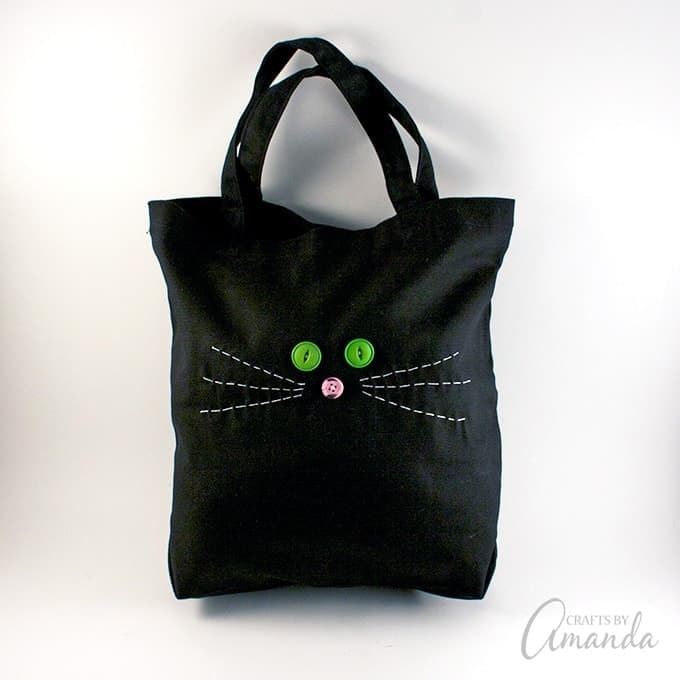 I originally made this cat tote bag for my book Button Mania: Buttons, Bottlecaps, and Beyond, which came out a couple years ago. You may remember when I posted about the Rainbow Button Wind Chime I made, I just LOVE all the colors! Thread needle with two strands of embroidery thread. 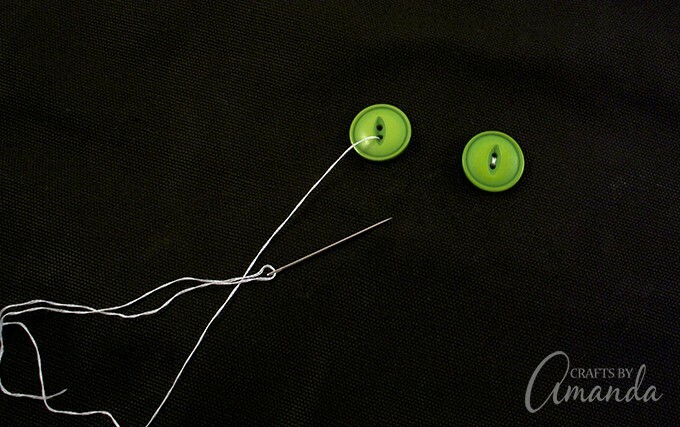 Starting from the inside of the bag, sew on one of the green buttons. Sew on the second green button next to the first. 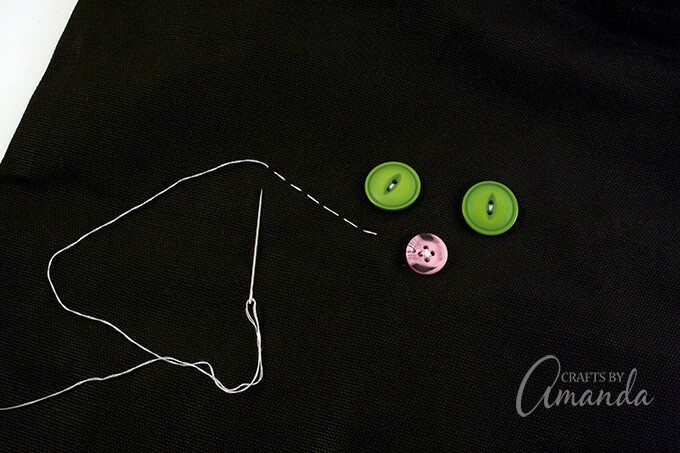 Sew the pink button on, between and below the two green buttons. Tie off thread behind the pink button on the inside of the bag and trim excess thread. Sew running stitches and both sides of the pink button for the whiskers. Tie off each whisker with a small knot inside the bag. Add a little glue to each spot where the stitches begin and end. I hope you enjoyed this project! Be sure to check out my books, they are all available on Amazon. If your kids are cat lovers too, be sure to check out this adorable little cardboard tube cat, which is part of my farm animal series. Kids will also love this paper plate black cat, great for Halloween! Have fun! I remember my grandmother making my brother and I a similar bag for halloween when we were young. With Halloween approaching this is a cute sewing idea for my daughter and I to sew and get some use out of her new hello kitty kids sewing machine. She could make a cute kitty cat bag for all her treats! Thanks for the great idea! My mom made my children Halloween bags a few years ago similar to this! The girls have black cats, and the boys received orange pumpkins! 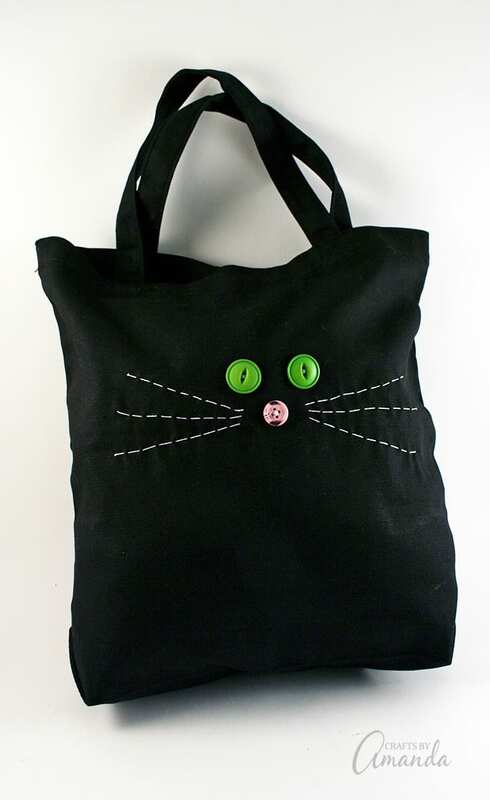 It’s such a cute idea, and I love the green buttons for eyes!